A Russian exchange student works to exonerate the brother left behind, a drug addict who has confessed to murder. 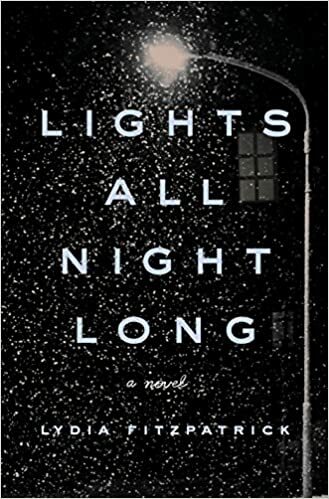 Lights All Night Long is a brutal but beautifully told story of love, loyalty, and home. Here, Lydia Fitzpatrick answers some of our questions about one of our favorite books of April. Erin Kodicek: Your mother is a Russian historian who spent time there during the Cold War; Your family hosted exchange students from Russia. How did these experiences and relationships inform the writing of Lights All Night Long? Lydia Fitzpatrick: I think we either resist our parents’ passions or embrace them. I remember waking up as a kid to find my mom asleep at the kitchen table next to her typewriter. She’d been up all night working on a book about commerce in Russia in the 1800s; her mind, it seemed to me, was always at least partly in Russia, and so I became fascinated by it too. As a kid, this fascination manifested itself in an obsession with Slavic fairy tales—Baba Yaga flying about in her ungainly mortar, and Snegurochka melting each spring. When I was eight, my family hosted two Russian students, Olga and Tatiana. Olga was six and a piano prodigy. We lived outside Washington, D.C., and she was staying with us to prepare for a duet with Rostropovich at the Kennedy Center. I remember her practicing on our old, rarely-tuned upright. It was otherworldly, the way she played; even tone deaf and musically uninclined as I was, I knew that I was lucky to listen. I was in awe of her and Tatiana (who was an architectural prodigy – though I can’t remember how this manifested itself), but the idea that they’d traveled so far from their homes and their families frightened me too. That tug, between adventure and those we leave in the pursuit of it stayed with me and became a big part of Ilya’s character. The brothers, and their extraordinary bond, are the heart of this book but initially Ilya was only going to be a minor character. What was your vision for Lights All Night Long when you first sat down to write it? Lights has shed a lot of skins, and I wish I could say that I’d had a clear vision for it when I first started writing, but I didn’t. For a while it was a novel based on a short story of mine in which a very different, very pregnant Sadie was the protagonist. In the wake of Deepwater Horizon, an oil worker on the Gulf became another point of view character. I was basically brainstorming ideas in longform for over a year, which—word to the wise—is an incredibly inefficient way to write a novel. At some point in this brainstorming, I started writing a scene in which Sadie meets Ilya on the first day of school. Ilya was meant to be a minor character, but Sadie was instantly captivated by him, and I was too. The scene grew longer and longer, and more and more awkward because I didn’t want him to leave the page. It was a bit like having a crush in the room and saying whatever you can to keep that person close. I let myself write Ilya’s backstory as a way to try to get him out of my system. Clearly that didn’t happen, and the novel in its current form took shape. There are characters in this book who do some very bad things, Ilya is sometimes openly critical of brother in this way, despite his love for him, and yet it’s easy to feel empathy for (most) of them. Is that the function of good fiction for you—to expand a reader’s empathy? Definitely. Unless you’re writing entirely autobiographically, writing is an act of empathy. It requires imagining another person’s experience of the world, their desires and disappointments, their pasts, their hopes, their habits and what has formed them. There’s a thrill in making this imaginative leap—that’s why I write—but there’s a risk in it too. There’s no guarantee that you’ll get it right. But when a writer does get it right, I think the empathy that was there in the creation is transferred to the reader. It comes to the reader as that little shock of connection, that realization that she’s seen herself in a character with whom she thought she had nothing in common. In the best fiction, the reader feels that little shock so often that it breaks her heart. There are some dark themes in this book—drug abuse, corruption, etc.—but the story is buoyed by characters who are trying to be helpful, who are trying to do the good and right thing even when circumstances are conspiring against them. What do you hope readers will take away from Lights All Night Long? Well, I hope Lights passes my own litmus test and manages to enlarge its readers’ empathy, and, of course, to entertain them! The novel does explore some dark themes in the service of getting across their universality. The opioid epidemic, for instance, is every bit as harrowing in Russia as it is in America; it is not something Ilya can escape through coming here. It’s a commonality, a reminder of the hopes and burdens and loves and losses that we all carry across borders, that we bring from our pasts into our futures. The lights of the title refer to the refinery lights, an omnipresence on Ilya’s horizon. They’re both tantalizingly close and unreachable, and to me they’re freighted with the hope and heartbreak of Ilya’s story. I loved the car ride scene when the Masons are taking Ilya from the airport to their home—there’s a lot going on there. It’s heartbreaking in a way, because Ilya is feeling guilty and pretending he can’t speak English, and there is awkwardness and irritation on both sides which adds some levity to the situation. To end on a lighter note, any humorous culture clash memories from when exchange students stayed with your family? A lot of that scene comes from my memory of picking Olga and Tatiana up at the airport. They didn’t speak much English, but my mother was translating from the driver’s seat, so it wasn’t nearly as awkward or as fraught as it is in the book. Still I cringe to think of the onslaught of questions I asked them—What do you eat for breakfast? What do you wear to school? What sound do roosters make in Russian? Molly asks Ilya this last question in the novel, and Ilya doesn’t answer her, but Olga was kind enough to indulge me. “Ku-ka-re-ku,” she said, which is an incredible series of syllables that I went around mouthing for months and working into conversations whenever I could.